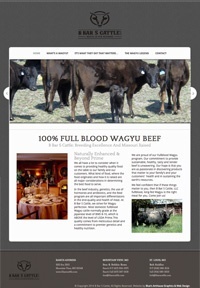 B Bar S Cattle is a Wagyu Beef Ranch in Mountain View, Missouri. I carefully chose this template because the earth tone color scheme, grainy background texture and stitching imagery of this template creates the feeling of stitched leather. The black logo at the top of the pages appears to be branded into the “leather” background.